During the World War’s, human rights for workers were pugnaciously abused. Fortunately and expectedly, the rise in our rights as workers have been on an incline since, and is constantly bettering for the health and safety of labourers. What is considered to be ethically correct is persistently changing around the world and in time. And rightly so. When we compare how workers were treated to how they are now, the difference and improvement is vast. Of course, we can’t say this on behalf of the whole world and every single workplace – there are obviously many human right laws being breached or yet to be put in place in certain areas. However, small improvements over time are better than no improvements at all. 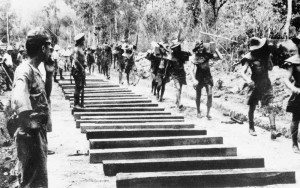 Back in World War Two, over in South East Asia, the Thai-Burma Railway (also known as The Death Railway) was being built. The decision to undergo this construction came about following the Japanese defeat at the Battle of Midway in 1942 because the Japanese navy were unable to promise the safe passage of supplies to its armies in Burma and New Guinea. The railway was 258 miles long and was built by the Empire of Japan. The working conditions started off manageable, however in the May of 1943, a monsoon struck making it unbearable. The rain brought infection, cholera and lead to the supplies being cut off and therefore people dying of starvation. The prisoners of war were dropped to the bottom of the social system and treated inhumanly. When the Second World War had ended, the Universal Declaration of Human Rights was put into action due the realisation of the dire horrors that took place. This occurred in 1948, and since then we have the HSE Standards, in the UK, which all construction sites, by law, have to abide by. Such policies include a place for preparing and comparing refreshments; dry/ changing rooms; drinking water; and toilets which must be kept clean. The full list of standards can be found at on the HSE website. To assure all of your standards are always met on your construction site workers are well looked after, Top Toilets has a wide range of portable toilet hire and washing facilities, from urinals, luxury toilets and disabled access portable toilets.